Wish you had more time for yoga? Do a pose right now, right where you are! Doing just one pose can change the way you breathe and feel…for the better! So stand up…yes out of your computer chair….. reach your arms up overhead (Urdhva Hastasana) and strrrretch up towards the sky. If you like fold from your hips and move into forward bend (Uttanasana). Ahhhh…feel better? You can also improvise and make up a pose like my daughter Lily. 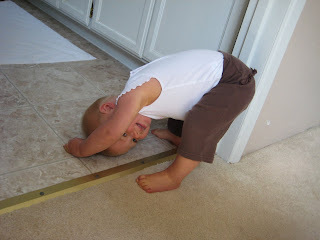 Here she is doing a cross between down dog and forward bend. Good job Lil! And smiling while doing yoga is even better, great for you mood! I completely got where they were coming from. Even before I really knew anything about yoga, I had heard the name. It seems like it is one of those yoga words everyone knows. But why? Victor explained to the curious student that it is a pose that is used regularly and is often one of the very first stretches beginners learn. It’s a transitional pose that is fairly comprehensive in its benefits to the body; having a positive effect on the shoulders, legs, spine, arms and feet. Furthermore, it’s thought to improve digestion, increase the blood flow to the sinuses, build strength throughout the body and even help your immune system. However, Victor was also quick to point out that despite its fame, it is not considered a superior stretch. 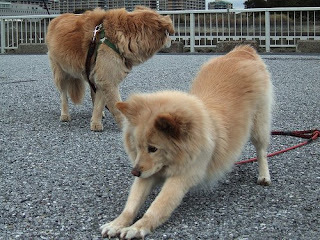 There is no technical reason why downward facing dog has become entrenched within the mass public’s notion of what yoga is all about (alongside Sting and herbal teas). So there must be some other reason. I would be so presumptuous as to suggest it’s good branding. It has dog in the title. You may laugh, but a large portion of the population love dogs. Sure there are other “cooler sounding” poses (Warrior pose, Cobra pose etc.) but at the end of the day we are all suckers for a cheeky-looking cocker spaniel. And there’s even a case to suggest it brings us closer to lost friends. I read about one lady who enjoyed the pose because it brought back fond memories of her very first puppy and made her feel closer to him in some way. Whether any of this hits a chord, or you think I’m barking up the wrong tree, I think it’s fair to say… for a number of reasons… the downward dog is a special pose.